Junior Seau, NFL all-star for the better part of 20 years, was remembered on the beachfront near his home where he committed suicide last week. As an avid surfer, it was only natural to remember the linebacker with a paddle-out. Junior Seau was remembered when several hundred people took part in the paddle-out where they formed a circle, held hands and said a prayer for the former football player. They splashed water towards the sky in remembrance, and a cousin of Junior Seau even took Seau’s board out for one last ride while hundreds looked on and cheered from the beach. The 43-year-old Junior Seau committed suicide by putting a bullet in his chest in his home in Oceanside. His girlfriend was the one to find him. Because of his nearly two decades in the NFL, Junior Seau suffered from numerous hard hits that led to head trauma. The repeated traumas most likely lead to Junior Seau developing chronic traumatic encephalopathy that is caused by excessive brain trauma; it cannot be diagnosed before death and is a probable cause for Seau’s suicide. Bruno also points out the similarities of Seau’s suicide and Dave Duerson’s suicide. Duerson took his own life in February of 2011 with a similar self-inflicted gun-shot wound to the chest. The difference is that Duerson “left notes and sent text messages indicating he wanted his brain to be donated to Boston University’s Center for the Study of Traumatic Encephalopathy—dementia caused by football-related concussions,” reported the Miami News Time. 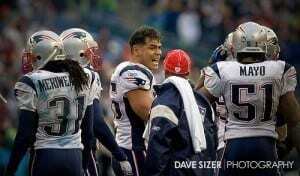 Currently, the family of Junior Seau is in the process of deciding whether or not to donate his brain for research in football-related injuries.